Demographic and Health Surveys (DHS) recently published a survey on the Pacific Independent State of Samoa. 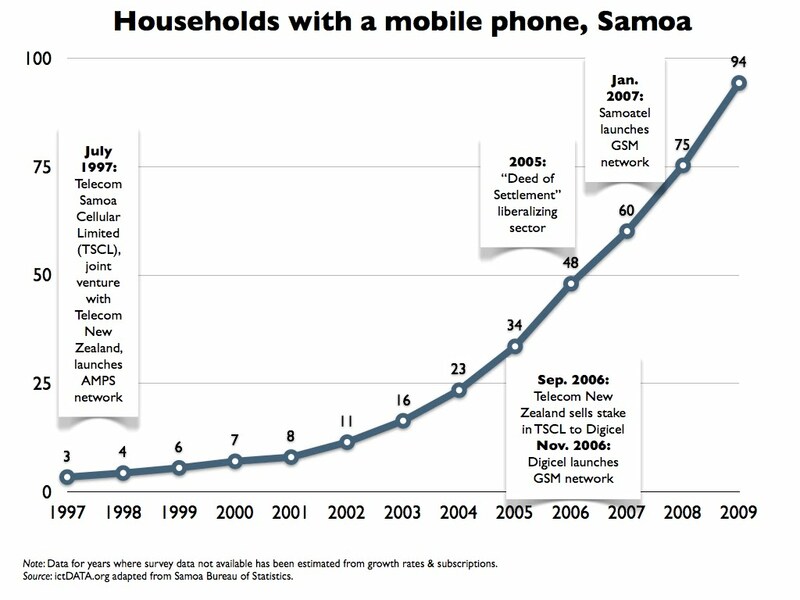 The survey includes data showing that penetration of mobile phones in Samoan households reached 94% in 2009, higher than many developed countries. 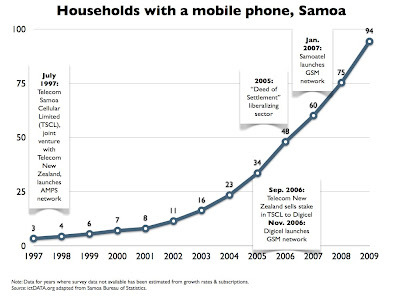 In fact, mobile phones are the most prevalent consumer item in a Samoan home, with a greater penetration than even radios and TVs. Samoa reached this milestone some 12 years after launching its first mobile network. Telecom Samoa Cellular Limited (TSCL), a joint venture between the government and Telecom New Zealand deployed an analog AMPS network in July 1997. Household penetration grew slowly, rising only around one percent a year through 2001. Penetration grew a little faster after that due to conversion to a digital AMPS network and price cuts in anticipation of a second mobile operator. Since TSCL had an exclusive ten-year license, the government had to negotiate a "Deed of Settlement" in 2005 where TSCL surrendered its exclusivity in exchange for the right to provide GSM and to have its own international gateway. Two GSM licenses were awarded in the first half of 2006 to TSCL and Digicel, a pan-Caribbean operator owned by Irish investors making its first foray into the Pacific. However Digicel ended up purchasing Telecom New Zealand's stake in TSCL. This made sense since it kept the company private allowing state-owned fixed line operator SamoaTel to enter the mobile market in 2007. The rest is history, with Samoa's mobile penetration skyrocketing following the introduction of competition. In 2010, the government announced its intention to privatize 75% of SamoaTel. The benefits of mobile competition for small island developing states was analyzed in a presentation made in 2004 at the Pacific Telecommunications Council. Samoa, with some 24,000 households, is a shining example that a small market can sustain competition. Ministry of Health, Samoa Bureau of Statistics, Apia, Samoa and ICF Macro, Calverton, Maryland, USA. 2010. Samoa Demographic and Health Survey 2009. The "Deed of Settlement" is discussed in: Ministry of Communications and Information Technology. Annual Report 2005/2006. ictDATA.org is licensed under a Creative Commons Attribution-NoDerivs 3.0 Unported License. © ictDATA.org. Powered by Blogger.